NYR Children's Collection, 9781681370927, 48pp. A boy wants a toy horse big enough to ride, but where can his father find it? Not in the stores, which means it’s got to be built from scratch. How? With the help of expert workers, from the carpenter to the painter, working together as one. And now the bold boy is ready to ride off in defense of the future! Two trams, Click and Zam, are cousins. Click goes out for a day on the tracks and before long he’s so tired he doesn’t know where he is or how to get back. All he knows is he’s got to find Zam. Click is looking for Zam and Zam is looking for Click, and though for a while it seems like nobody knows where to find Click, good and faithful Zam is not to be deterred. Peter’s a car, Vasco’s a steamboat, and Mikey’s a plane. They’re all running like mad and going great guns until, whoops, there’s a big old cow, just a plain old cow, standing in the road. What then? The early years of the Soviet Union were a golden age for children’s literature. 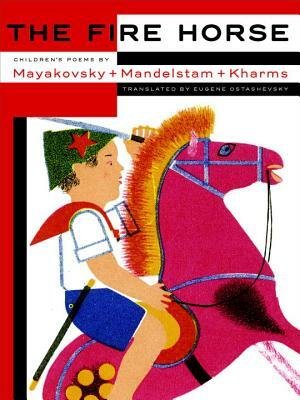 The Fire Horse brings together three classics from the era in which some of Russia’s most celebrated poets, Vladimir Mayakovsky, Osip Mandelstam, and Daniil Kharms, teamed up with some of its finest artists, Lidia Popova, Boris Ender, and Vladimir Konashevich. Brilliantly translated by the poet Eugene Ostashevsky, this is poetry that is as whimsical and wonderful as it is revolutionary. Eugene Ostashevsky is the author of two poetry collections and The Pirate Who Does Not Know the Value of Pi and the editor and translator of Alexander Vvedensky: An Invitation for Me to Think (both NYRB Poets). Osip Mandelstam (1891–1938), was an established poet who was unpopular with Soviet authorities The Selected Poems of Osip Mandelstam is available as an NYRB Classic and Voronezh Notebooks is available in the NYRB Poets series. Vladimir Mayakovsky (1893–1930) is best known for his longer poems Vladimir Ilyich Lenin (1924) and All Right! (1927). Daniil Kharms (1905–1942) was an absurdist poet and writer and founder of the avant-garde collective OBEIRU in 1928.